Get the Flash Player to see this Google AdWords tutorial. Google AdWords is one of the leading pay per click advertising programs on the web. If you learn how to use it right, it can drive traffic to your website and ultimately increase your online profits. This article aims to explain pay per click advertising and introduces you to Google AdWords. Pay per click (PPC) programs are the easiest way to advertise your business online. Done right, it can effectively drive traffic to your websites which can convert into sales. PPC is an advertising system in which you lead a targeted audience to your website. For each click on one of your ads you pay a certain amount of money. This sum is called the cost per click (CPC). The CPC is the amount you pay when someone clicks on your ad, clicking on the ad brings that person to your website. Ads on most search engines operate on PPC model. Ads are shown only to people who indicate an interest in a specific topic, this is done when a user types their query into the search box. The ads are separate from the organic (non-paid) search listings. PPC combined with SEO (optimizing your site for better search engine listings) can drive even more quality traffic to your website. You have great control over your listing position. You can get listed for all the keywords you want. You only pay the amount you think a click is worth. You the advertiser chooses the words that should trigger your ad to appear. This allows for your ads to appear beside search results that relate directly to the keywords you have chosen. For instance, if you run an online electronics store you might choose “HD Video Camera” as one of your keywords, when a user then searches for “HD Video Cameras” your ad could appear along side the natural search results. The benefit is that you are able to target your ads to people who are already searching online for information related to your business. Exactly where your ad appears also depends on your bid. Your bid is the amount you are willing to pay for each click. You decide how much each click is worth and compete against other advertisers for the top spots. However, most PPC programs reward advertisers that’s ads are more relevant to the search term and who have good landing pages. 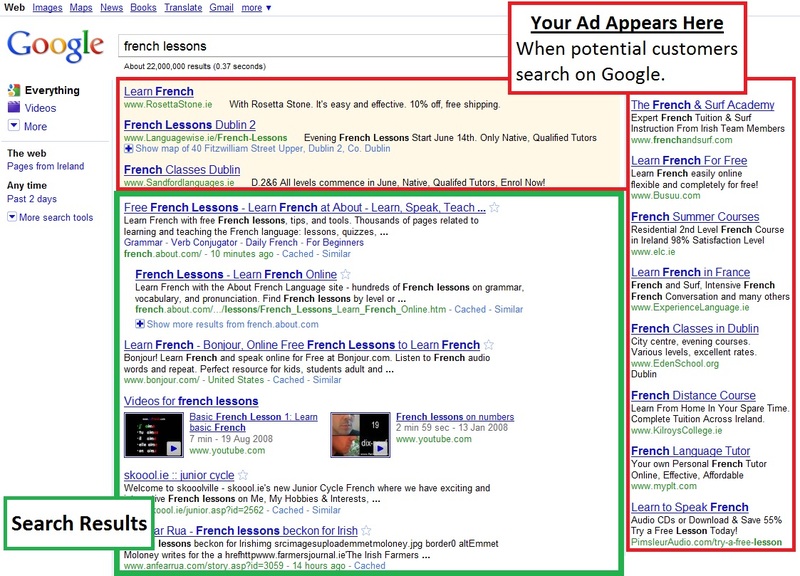 The more compatible your ad is with the person’s search query the higher your ad will appear in the ad space. You can compete against advertisers with bigger budgets than you by having highly targeted ads and a really good webpage. Build your list of keywords. Write some ads for every class of keywords. Bid for your position on each keyword. When people make searches using your keywords, the search engine displays your ad on the results page. Some people click on your ad (you pay for those clicks). Some of those people buy your product/service. Google AdWords and Microsoft adCenter are the leading providers of PPC advertising today. Microsoft adCenter is the search advertising platform that manages advertising on the Bing and Yahoo! search pages, and Bing content network sites like the Wall Street Journal, CNBC, and FOX Sports. Google Adwords provides the advertising for the Google Network which is split into the Google Search Network which includes Google and other search sites like AOL and Ask.com, and the Google Display Network which includes the likes of CNN, YouTube and Wired.com. Here we concentrate on Google AdWords, as currently AdWords is the biggest provider of PPC advertising. With AdWords, if you advertise on both the Google search network and the Google Display Network, you have the potential to reach three of every four unique Internet users worldwide. Your advertising is highly targeted. You choose the exact keywords that your ad displays for and also the keywords that your ad doesn’t display for. You are urged to produce relevant ads. Relevance leads to more people clicking on your ad (click-throughs). The more click-throughs your ad generates, the higher it ranks. That means more targeted visitors (and more customers) at the same cost. You control the cost. AdWords campaigns are 100% under your control. You decide how much you can afford to pay for each click (the maximum bid), and how much to spend overall (daily budget). AdWords minimises your costs automatically. For example if you set “blue camera” as a keyword and bid €0.10 per click, but there’s no one else bidding on this keyword, AdWords charges you only €0.05 per click (that is the minimum bid). You reach more people. With Google AdWords you gain access to almost 80% of Internet users worldwide. You can change anything, at any time: there’s no timing and no limit for changes. You benefit from state-of-the-art geographical and language targeting options. Further Reading: We recommend reading How To Setup Your First AdWords Account next, or select one of our other tutorials below.